Comparison of some book sizes based on American Library Association. The size of a book is generally measured by the height against the width of a leaf, or sometimes the height and width of its cover. 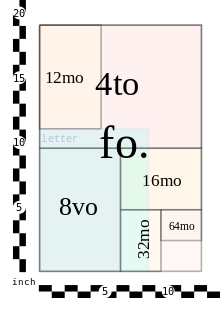 A series of terms is commonly used by libraries and publishers for the general sizes of modern books, ranging from folio (the largest), to quarto (smaller) and octavo (still smaller). Historically, these terms referred to the format of the book, a technical term used by printers and bibliographers to indicate the size of a leaf in terms of the size of the original sheet. For example, a quarto (from Latin quartō, ablative form of quartus, fourth) historically was a book printed on a sheet of paper folded twice to produce four leaves (or eight pages), each leaf one fourth the size of the original sheet printed. Because the actual format of many modern books cannot be determined from examination of the books, bibliographers may not use these terms in scholarly descriptions. In the hand press period (up to about 1820) books were manufactured by printing text on both sides of a full sheet of paper and then folding the paper one or more times into a group of leaves or gathering. The binder would sew the gatherings (sometimes also called signatures) through their inner hinges and attached to cords in the spine to form the book block. Before the covers were bound to the book, the block of text pages was sometimes trimmed along the three unbound edges to open the folds of the paper and to produce smooth edges for the book. When the leaves were not trimmed, the reader would have to cut open the leaf edges using a knife. Traditional book sizes/formats used in English-speaking countries. Based on the 19"×24" printing paper size. US Letter is added for comparison. See Further reading for more on imposition schemes. Today, octavo and quarto are the most common book sizes, but many books are produced in larger and smaller sizes as well. Other terms for book size have developed, an elephant folio being up to 23 inches tall, an atlas folio 25 inches, and a double elephant folio 50 inches tall. According to the 2003 Guinness World Records, the largest book in the world was Bhutan: A Visual Odyssey Across the Last Himalayan Kingdom by Michael Hawley. Its size is 1.5 m × 2.1 m (4.9 ft × 6.9 ft). According to the 2007 Guinness World Records, the largest published book in the world was The Little Prince printed in Brazil in 2007. Its size is 2 m × 3.1 m (6.6 ft × 10.2 ft). According to the 2012 Guinness World Records, the largest book in the world was This the Prophet Mohamed made in Dubai, UAE. Its size is 5 m × 8 m (16 ft × 26 ft). Though larger than The Little Prince, the two hold separate records, as This the Prophet Mohamed was constructed by hand, not published. The smallest book is Teeny Ted from Turnip Town measured 0.07 mm × 0.10 mm (0.0028 in × 0.0039 in). The largest surviving medieval manuscript is the Codex Gigas or 'Devil's Manuscript', measured at 92 cm tall by 50 cm wide (36 inches tall by 20 inches wide). The size and proportions of a book will thus depend on the size of the original sheet of paper used in producing the book. For example, if a sheet 19 inches by 25 inches is used to print a quarto, the resulting book will be approximately 12.5 inches tall and 9.5 inches wide, before trimming. Because the size of paper used has differed over the years and localities, the sizes of books of the same format will also differ. A typical octavo printed in Italy or France in the 16th Century thus is roughly the size of a modern mass market paperback book, but an English 18th-century octavo is noticeably larger, more like a modern trade paperback or hardcover novel. The following table is adapted from the scale of the American Library Association, in which size refers to the dimensions of the cover (trimmed pages will be somewhat smaller, often by about ¼ inch or 5 mm). The words before octavo signify the traditional names for unfolded paper sheet sizes. Other dimensions may exist as well. A common paperback size in the UK is B-format. For example, Penguin Classics are in B-format, which is 129mm x 198mm. This contrasts with A-format (110 mm × 178 mm) and C-format (135mm x 216mm). In book construction, Japan uses a mixture of ISO A-series, JIS B-series, and several traditional Japanese paper sizes. A- and B-series signatures are folded from a sheet slightly larger than ISO A1 and JIS B1, respectively, then trimmed to size. The most commonly encountered sizes are listed below. 重箱判 Jūbako ("Tiered Box") 20 40 7.2 × 8.1 18.2 × 20.6 Name refers to squarish shape. Folded from B-series standard sheets, yielding 8 more pages than JIS B5. 新書判/B40判 "Shinsho" ("New Book") / "B40" 40 80 4.1 �� 7.2 10.3 × 18.2 Half the size of Jūbako. Folded from B-series standard sheets, yielding 16 more pages than JIS B6. An informal, de facto standard, with some variation in finished sizes between publishers. 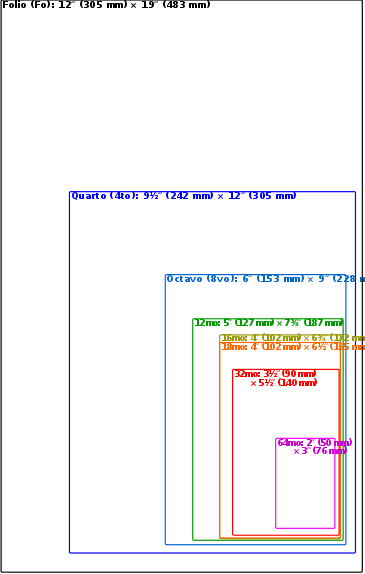 小B6判 "Small JIS B6" 32 64 4.4 × 6.9 11.2 × 17.4 Some publishers' "Shinsho" dimensions are closer to this size. folded from A-series standard sheets, yielding 16 more pages than A6. ^ Cf. Bowers,:429–430 suggesting that a book with eight leaves per gathering where the format cannot be determined should be referred to as in 8s and not octavo. ^ a b Thompson, Elizabeth Hardy, ed. (1943). A. L. A. glossary of library terms, with a selection of terms in related fields. American Library Association. p. 151. ISBN 9780838900000. ^ a b Roberts, Matt; Etherington, Don (1982). "Book sizes". Bookbinding and the conservation of books: a dictionary of descriptive terminology. Library of Congress. ISBN 9780844403663. Retrieved 2014-09-10 – via Conservation OnLine, operated by the American Institute for Conservation of Historic and Artistic Works. ^ a b Oxford English Dictionary (2nd ed.). Oxford University Press. 1989. ^ a b c d e f Gaskell, Philip (1972). A New Introduction to Bibliography (1st ed.). Clarendon Press. ^ a b c McKerrow, Ronald Brunlees (1927). McKitterick, David (ed.). An Introduction to Bibliography for Literary Students. Clarendon Press. ^ a b Bowers, Fredson (1949). Principles of Bibliographical Description (1st ed.). Princeton: Princeton University Press. ^ Associated Press (2003-12-16). "Guinness: Scientist creates world's largest book". CNN. Archived from the original on 2007-05-22. Retrieved 2007-06-07. ^ "Largest book published". Guinness World Records. ^ "Largest book". Guinness World Records. ^ "Smallest reproduction of a printed book". Guinness World Records. ^ Ringwalt, John Luther, ed. (1871). "Dimensions of Paper". American Encyclopaedia of Printing. Philadelphia: Menamin&Ringwald. pp. 139–140. ^ a b Savage, William (1841). "Paper". A Dictionary of the Art of Printing. New York: Burt Franklin. pp. 560–566. ^ Levine-Clark, Michael; Carter, Toni M., eds. (2013). ALA glossary of library and information science (4th ed.). Chicago, Ill.: American Library Association. p. 38. ISBN 9780838911112. ^ Ambrose, Gavin; Harris, Paul (2015). The Layout Book (2nd ed.). Bloomsbury. pp. 76–77. ^ Wilson-Fletcher, Honor (11 August 2001). "The importance of format and feel". the Guardian. Retrieved 6 April 2019. Voet, Leon (1972). "Appendix 8: Impositions and folding schemes". The management of a printing and publishing house in Renaissance and Baroque. The Golden Compasses: a history and evaluation of the printing and publishing activities of the Officina Plantiniana at Antwerp (the history of the house of Plantin-Moretus). Volume 2. Translated by Raymond H. Kaye. New York: Abner Schram. ISBN 9780839000044. Retrieved 2014-09-11. Caspar, Carl Nicolaus (1889). "Book sizes (in "Part VI: Theory and practice of the book trade and kindred branches", "c. A vocabulary of terms and phrases in English, German, French, Italian, Dutch, Latin, etc., employed in literature, the graphic arts and the book, stationery and printing trades, etc.")". Caspar's directory of the American book, news and stationery trade. Milwaukee: C. N. Caspar's Book Emporium. pp. 1310–1312 – via Google Books. AbeBooks. "Guide to book formats". Trussel, Stephen. "Book Sizes". Books and book collecting. ^ Cite error: The named reference Gaskell 1972 was invoked but never defined (see the help page). ^ Cite error: The named reference Roberts 1982 Book sizes was invoked but never defined (see the help page).